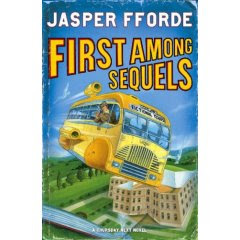 The Adventures of an Intrepid Reader: Warning - Jasper Fforde Ffangirl behaviour! I noticed when I was on Amazon UK tonight that the new Thursday Next cover and blurb is now up for the UK version. This is the version that we will most likely get! Can I just say.....I cannot wait to get this!!! It doesn't come out until July though. Reading that blurb makes me want it NOW! Good thing it is already on request at the library and I am no. 1 in the queue! I didn't even know there was a new Thursday Next book coming out! I only just got copies of her Nursery Crimes books. I have just wasted basically a whole Sunday happily exploring all the blog links you have up! I've had great fun and found several to add to my rss feeds. Can't wait to read it, though!